CHELSEA — When Tony Sweet gave up truck driving for dog walking more than two decades ago, he started off slowly — taking one dog at a time out for a stroll. 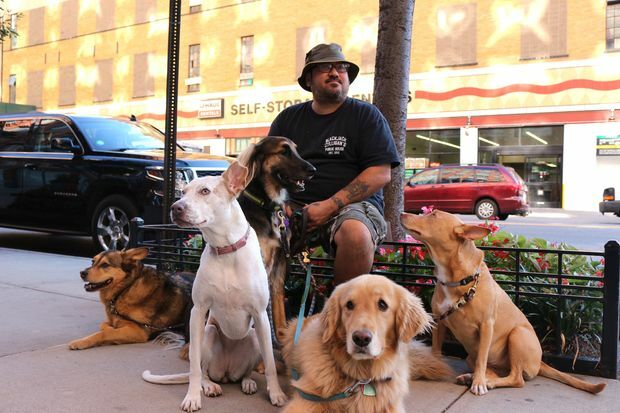 But on a recent afternoon, the 50-year-old hit 10th Avenue with a pack of eight pups, passing art galleries and restaurants and stopping on occasion as passersby asked for photos with the dogs. While that may seem like a lot of leashes to handle, it was actually a leisurely day for the longtime Chelsea resident — who takes up to 15 dogs out at a time for tours of the neighborhood. "... [As] I started adding dogs, I started to realize the dogs enjoyed being with other dogs," said Sweet, who has been walking dogs for 25 years. “People were seeing me walking with all the dogs, and … I started getting more and more requests." Sweet has since become a fixture on the West Side, growing his reputation by documenting his canines’ travels on his Instagram page, which has gained more than 1,800 followers. He has a knack for getting his pooches to pose calmly in front of neighborhood locales — from the steps in front of P.S. 11’s painted doors to the Chelsea Waterside Dog Park at West 23rd Street and 11th Avenue. The columns outside the Church of the Guardian Angel, at the corner of West 21st Street and 10th Avenue, provide a frequent backdrop for photos. On Friday, passersby stopped to snap photos as the dogs posed outside the church, with Sweet joining the pooches for a few shots before taking a few of his own to post on Instagram. “The owners love seeing their dogs on there — they show everybody,” he explained. Sweet, who grew up in Hell's Kitchen, was a nighttime truck driver for eight years before he started walking dogs part time around 25 years ago. "I come off of work, there's nothing to do," he recalled. "So, I borrowed my friend's dog, to go walk around in the park, and I met somebody who was a dog walker. That's where I got the idea." Five years in, he made it a full-time gig, securing clients "by word of mouth and people just seeing how I interact with the dogs," he explained. Sweet lived in Chelsea — where one of his four children still resides — for around 25 years before moving to New Jersey three months ago, though he is currently searching for a new apartment in the neighborhood. But judging by his Instagram page, he never really left. Along with dozens of dog photos, snaps of some of Sweet’s less conventional dog-walking methods appear on his page. A few times, he rented a Citi Bike and pedaled down the sidewalk while the dogs trotted at his side, he said. For a few months, Sweet used a van he’d originally rented for moving to drive the dogs to different locales around the city. “I would pick them all up in the van, and we would go to different parks, instead of just going to one park,” he said. Now, Sweet sticks mainly to Chelsea — where all of the dogs live — but every day is still “new and different,” he said.